Tax day provides yet another opportunity to assess what the data says so far about the record of the 2017 Republican tax law, the Tax Cuts and Jobs Act (TCJA). With a year’s worth of data in, the story remains the same—there’s no evidence the corporate tax cuts in the TCJA have trickled down to workers. First, a quick refresher on the economic theory that links corporate tax cuts and workers’ wages. Higher after-tax corporate profits are passed down to shareholders in the form of dividends. Higher dividends incentivize households to save more (or attracts more savings from abroad) by putting more money in the stock market. Those increased household savings push down interest rates, which makes it easier for corporations to borrow money and invest in new plants, technology, and equipment.1 Those investments give workers more and better tools to work with, which boosts their productivity, and eventually that increased productivity is supposed to translate into wage growth. That’s quite a long chain of economic events that has to happen before wages start to rise. Clearly, the media should’ve never taken the claims made by proponents of the TCJA and their corporate allies that workers would immediately see benefits seriously. Unsurprisingly, those cynical claims didn’t pan out. We’ve long pointed out that every single link in that chain is likely to break down, and so there was little to no chance that the TCJA’s corporate tax cuts would trickle down to boost workers’ wages. But if American workers are going to have any chance at all from benefitting from the TCJA’s corporate tax cuts, capital investment has to take off first. With a year of data in, have we seen an investment boom? No. Instead, the upward trend of investment growth has stalled in the wake of the tax cut. The chart below shows the year-over-year growth in real, nonresidential fixed investment. Source: EPI analysis of data from table 1.1.6 from the National Income and Product Accounts (NIPA) from the Bureau of Economic Analysis (BEA). Investment growth had been trending upward prior to the passage of the TCJA, but that trend has stopped since. 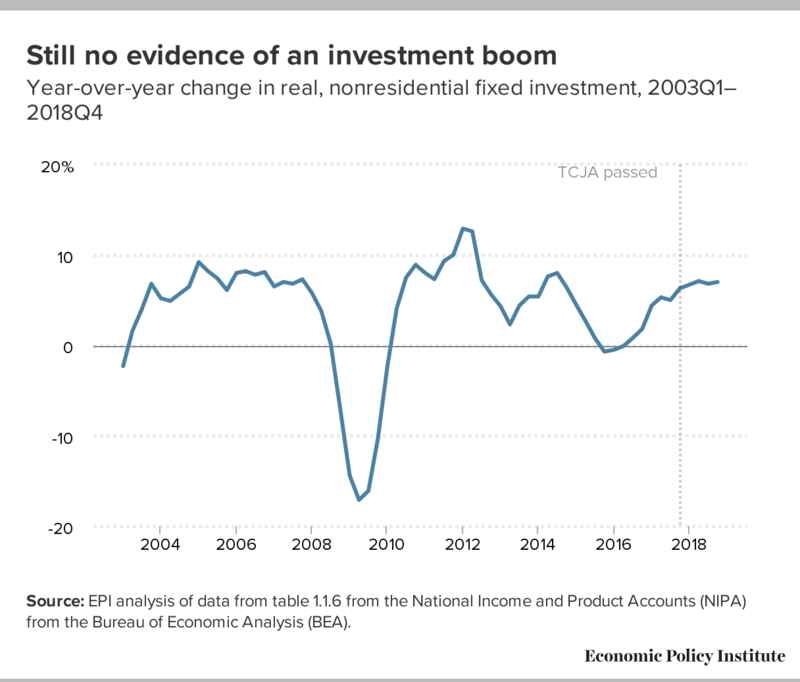 That’s not to say that the TCJA itself stopped the upward trend in investment growth—but it sure is nothing like the investment boom its proponents promised. This should come as no surprise. The previous history of corporate tax cuts gave us absolutely no reason to believe that these cuts would trickle down to average workers. The TCJA is set to exacerbate decades of rising economic inequality. The bill blew apart the individual and corporate tax codes with egregious new loopholes tailor made for the rich and big corporations. And the data offers no reason to think any of this will start trickling down to typical workers. All while the president’s budget leverages the deficits created by the TCJA to claim that cuts must be made to public investments, education, Medicaid, the Affordable Care Act, and other programs working families rely on. The evidence continues to pile up against the TCJA; it’s high time it was repealed. 1. One important note is that because the TCJA increased deficits, putting upward pressure on interest rates, this already shaky theoretical foundation collapses.